Dermal fillers such as Evanthia are used as an effective treatment for deep lines and wrinkles. They can help reduce deep lines and wrinkles, fill hollows and smooth the contours of your face. Anti-ageing facial fillers are the non-surgical way to achieve younger looking skin and provide volume for tired lines and wrinkles. A personal treatment plan designed to meet your individual needs is completely free of charge. Dermal filler treatments start from £180 but the price can vary dependant on the filler being used and the number of sessions required. Premium dermal fillers are injected in small controlled doses just under the surface of skin of the area to be treated. This fills out the sunken areas and lines to give a smoother, firmer and more refreshed appearance. 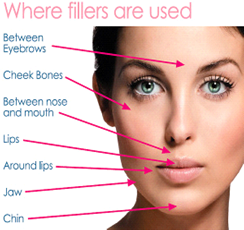 Depending on the type of dermal filler used, results can last from 6 to 24 months. Sculptra is injected into the deep dermis and helps to replace lost collagen. It is a one time treatment. Small amounts of dermal filler are injected directly into the skin using an ultrafine needle. After cleansing the area to be treated, a numbing cream will be applied. This ensures the injections administered by the qualified beautician will only cause minor discomfort. No recovery time is required after dermal filler treatment and you can return to day to day activities straight away. You may experience some slight swelling or bruising to the area being injected and typically doens't last longer than 48 hours.Your aesthetician will discuss your recovery and what to expect when you attend you appointment. 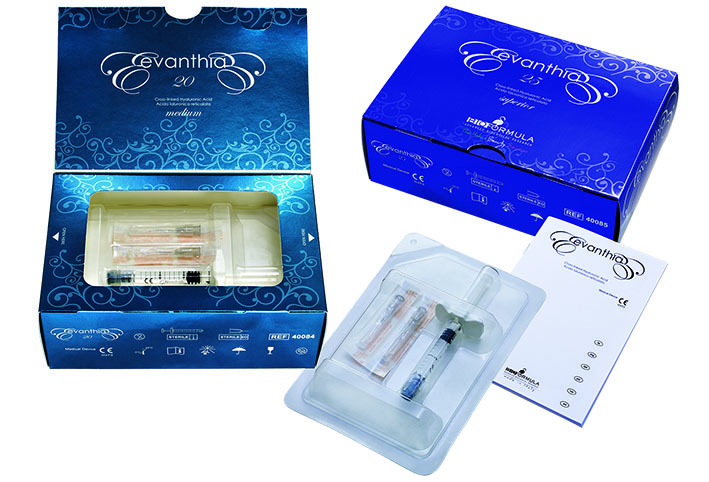 Evanthia TM - A group of dermal fillers that are based on Cross-Linked hyaluronic acid. Evanthia's action consists in increasing the voume of the dermo-epidermal tissue based on the natural ability of the hydrophile molecules of hyaluronic acid to bind to quantities of water that are many times heavier than they are. This allows then to fill the intradermal spaces and fill the intercellular matrix, making the tissues firmer. The reticulation of the hyaluronic acid contained in the product makes the filler effect more stable and lasting over time. Highest concentration of cross link hyaluronic acid in comparison with other similar fillers. Visible effect after the first procedure. The duration of effect of 4 to 18 months. Simplicity and efficiency of operation. CE-certified production process Evanthia ensures sterility of the drug due to absolutely aseptic production method which eliminates the degradation in contrast to the traditional hot sterilization. It ensures complete stability, retains the physical and chemical properties of the active ingredients, and also ensures long-lasting effect of the preparation when applied. The hyaluronic acid used in the formulations Evanthia, obtained bacterial biofermentation patented method. A high degree of purification (endotoxicity level bacterial ˂0,2 EU / ml -smaller than the specified minimum level of the European Pharmacopeia for injectable preparations), as well as low concentrations of residual nucleic acids and proteins, allow for minimizing the risk of allergic reactions. Due to the special content cross-linked agent, toxic drugs Evanthia indicators is much lower than in preparations containing any other cross-linked agents.